I was a much bigger fan of the vanilla cake balls. My wife Sonia really liked the chocolate ones. We both agree that especially the vanilla ones felt and tasted more like raw cookie dough with a white chocolate shell than actual cake. The difference is that I like cookie dough and she does not. 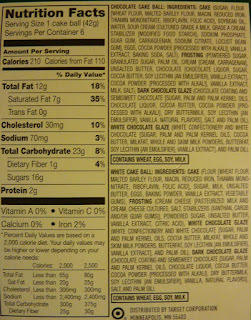 I would also argue that the chocolate ones tasted more like cake-batter than actual cooked cake. But Sonia thinks they were cakey enough. 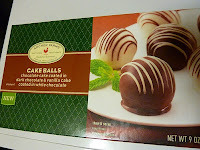 I think the box underestimates the thawing times for the cake balls. I would just about double their estimation that 45 minutes at room temperature is enough. Go ahead and leave them out for an hour and a half before you eat them. Likewise, keep them in the fridge much longer than they recommend if you prefer to thaw them that way. They're really rich. But more than "rich," they're "heavy." Like...you eat a bite, and you're kinda full. And I love to eat dessert. I usually eat way too much. But with these, I was able to stop at one "ball" per meal. And that brings me to my next point: avoid use of the word "balls" when dealing with food products. I'm not going to go into all the details of how I came to that conclusion, but just suffice it to say that I'm not entirely keen on walking around my home talking about "eating balls." And honestly, Target, your balls are overly big. No really, they should have made them much smaller and called them "bites," thus avoiding embarrassing wordplay like, "Man, these balls are so big I can't fit them in my mouth!" I mean, I would apologize for filling a food blog with such perverse double-speak, but really it's Archer Farms' fault. Seriously, guys? Balls? Weird wordplay aside, I don't think I'll be buying these again anytime soon. I'd rather get more crème brûlée or strawberry cheesecake yogurt. 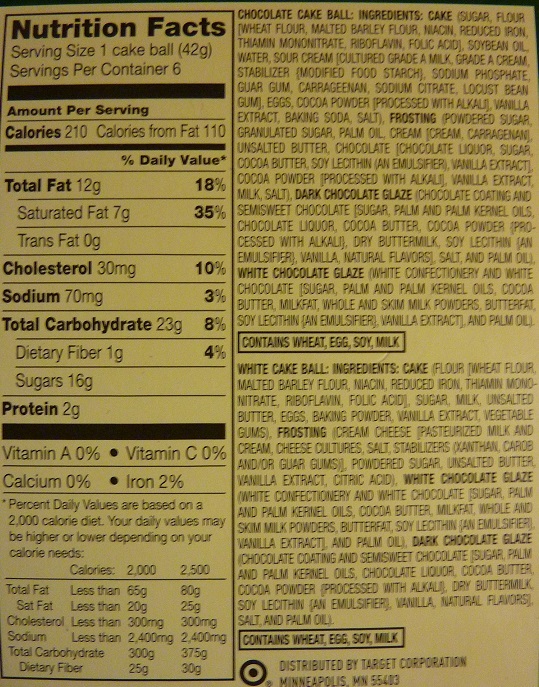 And if you care to read the novel that is the ingredients list(s) for this product, go ahead and click on that image on the right side of this post. I would have given these only 6 stars, but Sonia seemed way more fond of "the balls" than I was, so I guess I'll be generous and give 'em a 7. 7 out of 10 stars.